Here you can send support requests to MH Themes support staff in case you need further assistance with your WordPress theme. Theme support is provided during our business hours from Mon-Fri, 8am – 8pm CET/CEST. Support requests usually are answered by our support staff within a few minutes, but please allow up to 24 hours to answer your request. Although standardized WordPress themes are available at low cost and of course don’t come with the same level of service and support as when you would hire a personal web designer for a few hundreds, up to thousands of dollars, you still have support included. That means in case you have questions about your WordPress theme or need additional assistance, you can send a support request and the support staff will answer your questions. If you don’t want or can’t install and configure your theme by yourself, then we also offer a paid theme installation service where we can install and configure the theme for you to replicate the layout of the theme demo. For more information please visit this page: Installation service. 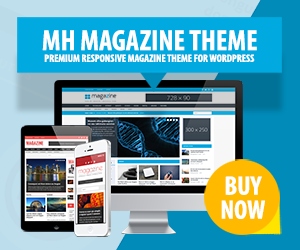 MH Magazine is a very powerful and flexible WordPress theme. We’ve created extensive documentation for this theme to help you launch an awesome website. In addition you can have a look at the answers to frequently asked questions as your request may already be covered there. When sending a new support request, please always try to explain your issue as detailed as possible and provide as much information as you can to avoid unnecessary back and forth. We can answer support requests in English or German language, any other languages are not supported. NOTICE: Before sending new support requests to our support staff, please always check if your questions are not already answered in the theme documentation for your theme and check the tutorials in the support center (use the search function) for existing answers to your questions. In case you bought one of our premium themes, you must enter your order id. The following file types are allowed: jpg, gif, png, pdf, txt, log. Max 1 file with 2 MB size.